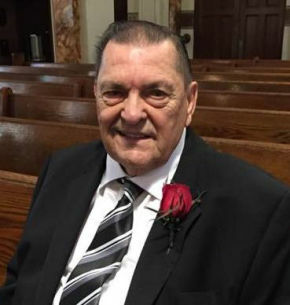 Anthony J. Rucco, age 81, of Hawthorne, NJ passed away on Wednesday, March 27, 2019. Born and raised in Pittston, PA, he resided in Rochelle Park and Hackensack before moving to Hawthorne ten years ago. He was a parishioner of Sacred Heart R.C. Church in Rochelle Park. A sports enthusiast, especially of football, he enjoyed vacationing with family. Prior to retiring in 2008, he was a security officer with Bergen Regional Medical Center in Paramus for 20 years. Previously, he was a mechanic with the assembly division of Ford Motor Company in Mahwah for 20 years. Beloved husband of Marlene (Long) Rucco. Loving and devoted father of Michelle Newman and fiancé Robert Cooney and Renee Elovitz and husband Jeff. Cherished grandfather of Matthew Newman and wife Mariela, Michael Newman and Jennifer Elovitz and fiancé Michael Barden. Dear brother of Patricia Girman. The family will receive relatives and friends Friday, March 29, 2019, 4-8 pm at Vander Plaat-Caggiano Funeral Home, 13-31 Saddle River Road, Fair Lawn, NJ, 201-797-3500. A funeral service is planned for Saturday, March 30, 2019, 11 am at the funeral home. Cremation will be private.